There is no doubt that Standing Rock changed the way national media outlets think about Indian Country. More than a year after thousands of people gathered to stop the construction of an oil pipeline over Sioux protests, the desire to tell the stories of Indigenous communities is stronger than ever. Unfortunately there aren’t enough publications that know how to tell those stories accurately. Yes, many of these accounts are technically factual, but media have a hard time, even today, properly representing Native communities across the country. Earlier this year, the Native American Journalists Association, where I am a board member, worked in conjunction with High Country News to produce a bingo board for reporters, to help them avoid clichéd storytelling from Indian Country. Too often reporters parachute into Native communities to report on the tragic effects of U.S. policies, especially the removal of tribes from their lands. Many times that reporting fails to provide the proper historical or cultural context. These well-intentioned reporters rely instead on the overwrought myths that have permeated people’s understanding of Native Americans for centuries. 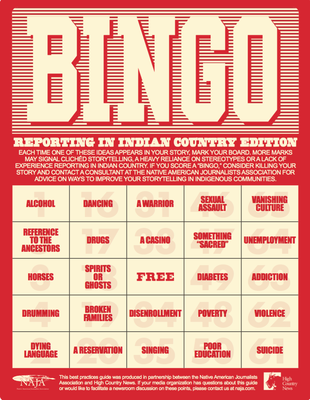 The bingo board helps reporters avoid overuse of ideas like “warrior,” “drumming,” and “diabetes,” thereby avoiding the kind of one-dimensional coverage that Indigenous communities have long resented. If you think such misconceptions are uncommon, consider the debate over sports mascots, or most film depictions of Indigenous people, or the would-be president, Donald Trump, who told a House committee in 1993 that certain casino operators “don’t look like Indians to me.” There are 567 federally recognized tribes, and many more who lack the distinction, in the United States. There are 5.4 million American Indians and Alaska Natives, and none of us look like Pocahontas. What message does it send to the country’s Native youth when the leader of the free world uses their race as an insult? To consider all tribes the same is woefully inaccurate. To report so is dangerous. It undermines their unique histories and the multi-faceted legacy of sovereign nations. We can do better, and we have role models to guide us. Tim Giago, the founder of the Lakota Times on the Pine Ridge Reservation, used the pages of his paper to speak out against the rampant violence on the reservation. He wrote editorials under constant threat. His newsroom was once firebombed, its front window repeatedly shot out. Despite this, the Lakota Times doggedly exposed discrimination and wrote about communities in a way that enacted real change. Needless to say, I greatly admire Tim. Reflecting on the future of journalism in Indian country, Tim reminded a gathering of Native journalists this year: “We can’t know where we are going until we know where we came from.” It’s a good message—for Natives and non-Natives alike. As Native peoples, we must continue trying to understand our histories, and as journalists we should strive to know those histories to better inform our reporting and better serve the public. We must confront the ongoing damages of historical trauma, political disenfranchisement and persistent marginalization and push ourselves to understand and report them. And we must do that without resorting to stereotypes. And so I have accepted the role of contributing editor for High Country News’ burgeoning tribal affairs desk. As both a professional journalist and a member of the Cherokee Nation, I hope to help the magazine in its commitment to better storytelling from Native communities — and for them. Our hope is that our coverage will stand apart, in seeking stories by and about Indigenous peoples, and to ask challenging questions about who we are as a country, how we got here, and what that means for hundreds of Native communities across the West. We want to hear from Indigenous reporters, writers, commentators, and scholars, as well the non-Native writers who have something meaningful to add. We are committed to three-dimensional storytelling, and seeking Native expertise and perspective in all that we cover. Currently, we are working on stories about Native youth in the foster system, human trafficking in tribal lands, and the greater federal structures that govern the relationships between tribes and the United States. It is important to us these stories be told through on-the-ground reporting and through intimate profiles of the people involved. In the years and coverage to come, we look forward to illuminating invisible worlds. Wado.